Seventy-eight years ago this month, two elderly Germans found themselves on a train to Athens. As they watched the scenery chuff past, they discussed arrangements for what would be the biggest sporting festival the world had seen – the 1936 Berlin Olympics. The older man, Theodor Lewald, was president of the organising committee for the Games; his companion was Carl Diem, the committee's secretary-general, who had captained the German Olympic team at Stockholm in 1912. While the two men headed south, Diem had a brainwave. Wouldn't it be a great idea, he suggested, if the Olympic flame were carried by a torch relay from Olympia all the way to Berlin? There could be no more vivid a way of linking the capital of the new German Reich with the original games of classical Greece, whose culture Hitler so admired. Lewald agreed, as did the International Olympic Committee members they were to meet in Athens. What the men could not appreciate was that the torch would become emblematic of the uneasy links between politics and sport. It took the Nazis to realise the full propaganda potential of the Olympics, and thanks to them the torch quickly became a symbol more of political willpower than harmless sporting pageantry. However, the road from Greece to Germany was paved with good intentions. Before the first torch relay took place, the event was "blessed" by Baron Pierre de Coubertin, the founder of the modern Olympics. He declared that through the event "there will be established the vigorous and well-considered peace appropriate to a sporting epoch of high ambition and strong will". Ironically, the partly Jewish Lewald described the relay in terms of the cod Nazi history of which Himmler would have been proud. The torch created, he claimed, "a real and spiritual bond between our German fatherland and the sacred places of Greece founded nearly 4,000 years ago by Nordic immigrants". The relay was a triumph of organisation, 3,331 runners carrying the flame all 3,187 kilometres to Berlin. But it did attract controversy. As the torch – forged from the same Krupp steel that would be used to build Hitler's panzers – made its way north, it became a magnet for Nazis and their sympathisers. In Vienna, 10,000 Austrian Nazis greeted it with shouts of "Heil Hitler!" and, predictably, the Horst Wessel song. When Jewish members of the Austrian Olympic team gathered to see the torch, they were abused by Nazis, and 500 arrests were made. So much for De Coubertin's fine words. Despite these disturbances, the Germans were so proud of the relay that Lewald upbraided De Coubertin for not giving the host nation more credit. "I cannot hide from you my extreme surprise," wrote Lewald, "that you have not given a single mention of the fact that the idea for the torch relay is a purely German idea." To add further irony, it was Carl Diem who addressed thousands of Hitler Youth in the Olympic stadium in March 1945, calling on them to show "Olympic spirit" by refusing to surrender to the Russians. As an extra incentive, execution stakes had been erected around the stadium to inspire any boys who did not feel "Olympic" enough. Two thousand of those he addressed that day were killed before the end of the war. Nevertheless, the Germans eventually honoured Diem by putting his face on a postage stamp in 1968. That's the great thing about Olympism – it's not just about being faster, higher, stronger, but also about forgetting. We ourselves might do well to remember the somewhat sordid past of the torch relay when the flame reaches British shores on Friday Just as with 1936, the torch can be seen more as a political symbol than a sporting one, just as we witnessed four years ago when it made its controversial way around the globe for the Games in Beijing. Then the flame was surrounded by a mob of police heavies, which perfectly represented the controlling nature of the Chinese regime. 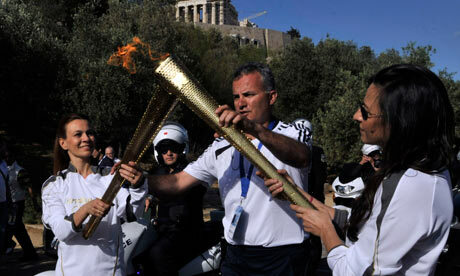 In truth, the torch has become more a symbol of the desires of the host country than of the Olympic movement. As the flame passes through our towns and villages, will we see it as a flaming beacon of a Cameroonian "big society", or something a little less confident – a flickering tealight caught in a mighty global wind?